“NCAA head coach reacts to criticisms his boss made on a independent blog’s podcast by logging on to Twitter and tweeting a couple of emojis” is one of the more bizarrely 2018 stories out there, right up there with anything involving the BIG3, Qatar and Steve Bannon or Dennis Rodman and North Korea. 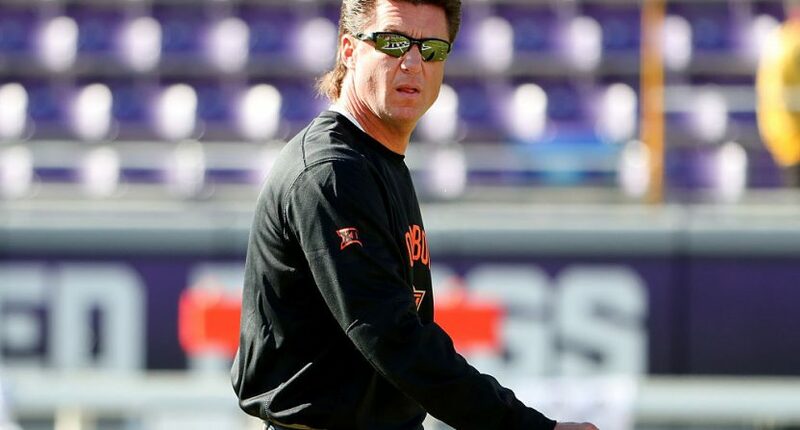 The coach in question is Oklahoma State’s Mike Gundy, who’s been there since 2005, is the school’s all-time winningest coach, and has led the Cowboys to a conference title (in 2011), a divisional championship (in 2010), a 114–53 overall record (69–42 in the Big 12), and seven AP Top 25 finishes. But while Oklahoma State athletic director Mike Holder had some praise for Gundy in a wide-ranging podcast interview published Monday (with Kyle Porter and Carson Cunningham of independent Oklahoma State blog Pistols Firing; Porter is also known for his work as a golf analyst for CBS), he also had some criticisms, particularly saying that the Cowboys needed to be higher in the recruiting rankings. “You’ve got to give credit to Mike Gundy. He’s really matured into a difference maker as a coach. I would approach recruiting a little differently than he does. I’d want to finish higher in those recruiting rankings than we consistently do. I think that ultimately puts a ceiling on what you’re able to achieve. We do a great job of overcoming that with [strength and conditioning coach] Rob Glass down in the weight room, and I think our coaches do a great job of disciplining and motivating and channeling what talent we have in the right direction. I just think we would be better served with a few more James Washington’s coming in the front door – you know, he came in as a two-star, three-star, left a five-star – we need to take some of those five-stars and turn them into seven-stars, which I think Rob Glass could do, and I think Mike Gundy could as well. So, let’s break this down. Those aren’t the world’s harshest criticisms, especially in their full context, and Holder is generally right about the value of recruiting. See any of the many articles Matt Hinton has written on this over the years, for example, or the updated one Stewart Mandel wrote in 2016 at FoxSports.com (RIP, Fox written content); there are always exceptions of under-the-radar players becoming stars and teams overperforming their recruiting, but on the whole, success in recruiting rankings is very predictive of teams’ on-field success. And, as Holder notes, he has some first-hand experience in recruiting from his over three decades as the Cowboys’ head golf coach, and they’re a rare NCAA program to get a NBC Sports all-access documentary thanks to their remarkable success over the years. But golf isn’t football, and while a better performance in the recruiting rankings would likely help Oklahoma State’s football record, Gundy presumably knows that too. It’s also not clear how much of that is on him and how much of it is just about the challenges the Cowboys face; he’s talked in the past about the difficulty of getting top recruits to consider going to Stillwater, especially in a conference with the likes of Texas and Oklahoma. And “I would approach recruiting a little differently than he does” is not just “We need to recruit better as a program,” it’s specifically saying that Holder doesn’t entirely endorse how Gundy is handling the situation. The “wow” moment of the podcast was Holder’s reference to recruiting rankings. Instead of addressing recruiting during a publicly consumed podcast, Holder could have used a different strategy. He could have taken two plates of food to the west end of Boone Pickens Stadium. There could have been a lunch meeting in Gundy’s office. Instead, there was the podcast. And that’s really what’s at issue here. Coaches and athletic directors aren’t always going to agree, and to his credit, Holder even notes that on the podcast and says that Gundy has the final say on football matters. “At the end of the day, [booster] Boone Pickens, Mike Holder and Mike Gundy all want the same thing,” said Holder. “We may not always agree on the best course to get there, but at the end of the day Boone Pickens and I have always deferred to Mike Gundy because he’s the guy in charge.” Great. But if that’s the case, why are you taking your issues with his recruiting approach public? That’s far from “deferring.” And yes, in the full context of everything Holder said, there’s plenty of support as well as criticism, but it’s the criticism that’s newsworthy, especially for a coach who’s done so much to build up Oklahoma State (his alma mater), has found significant success, and who has turned down more lucrative offers elsewhere. And someone who’s been an AD for more than a decade should be well aware of what kinds of comments make news, and should be aware that they’d have this sort of impact.